Accommodate your TV with the stylish modern design of this TV stand and tall pier set. For storage, the TV stand features two side shelves and two center shelves for plenty of room for electronic devices. Two drawers with replicated oak drawer fronts and large matte black hardware provide contrasting style. Each tall pier bookcase includes a top light to highlight your accessories on the two adjustable glass shelves. The door with two shelves inside on each bookcase also provides functional storage to complete the wall unit. The Harlinton Large TV Stand & 2 Tall Piers by Signature Design by Ashley at Sparks HomeStore & Home Furnishings Direct in the Thatcher, Cottonwood, Safford, Sedona, Morenci, Arizona area. Product availability may vary. Contact us for the most current availability on this product. 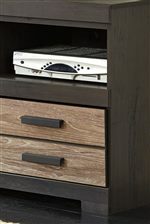 Storage TV stand center shelf is removable/adjustable. TV stand has 2 side shelves and 2 drawers. Each pier: Door opening (faux drawer look) 15.50" x 12.50" x 19.25"; Media opening 15.50" x 12.50" x 43.50"; Shelf opening 15.50" x 12.50" x 14.25"; Cord length 72.00". Rustic meets modern with this entertainment furniture collection. A warm gray vintage finish is complemented by replicated oak finish drawer/door fronts for a two-tone look. Several configurations are possible with the pieces available, so you can put together something ideal for your living room. The Harlinton collection is a great option if you are looking for Contemporary furniture in the Thatcher, Cottonwood, Safford, Sedona, Morenci, Arizona area. 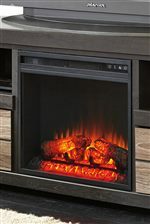 Browse other items in the Harlinton collection from Sparks HomeStore & Home Furnishings Direct in the Thatcher, Cottonwood, Safford, Sedona, Morenci, Arizona area.